Finally! 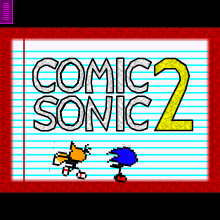 After a weeks worth of level designing and graphic making, I have completed the sequel to the game Comic Sonic! In this game, Comic Sonic is joined by his friend Tails on another epic adventure! Yes, that means that this game is two player! Grab a friend and let them in on the fun! The level designs have now been changed to allow Tails to be more of a help, and a whole new list of gimmicks have been installed in the game of the Comic Sonic series. So have fun, and once again dive into his world!